head. The cutter is raised to rifling position by placing very thin shims beneath it in the slot. These shims should be only .0002" to .0005" in thickness, preferably the thinner one. After the cutter makes a cut in each groove, another shim is placed beneath the cutter, another cut made in each groove and this process continued until all grooves are cut to the proper depth. A small hole is drilled through the rifling head in the bottom of the cutter slot so that a small pin-punch can be inserted through the hole to push the cutter up out of the slot in the rifling head. The commercial, or factory-type rifling head, is a hollow or tubular piece of high-carbon tool steel, hardened. The hook-type cutter is set in a port within this tube and the hook or cutting edge is about one fourth of the length of the cutter from the rear end. The tail of the cutter is beveled off at a thirty-degree angle on the top side and the rear end of the port in the rifling head is beveled at this same angle. The cutter is beveled both ways on the bottom from a point directly beneath the cutting edge. This bottom bevel is ten degrees. At the rear of the rifling head a beveled wedge goes in, which rests beneath the beveled rear of the cutter. The bevel of the wedge is the same as the bevel on the bottom of the cutter, ten degrees. This beveled wedge is pushed forward by a screw, threads for which are tapped into the rear of the rifling head. Screwing this screw forward in the rifling head results in pushing the beveled wedge farther forward under the tail of the cutter thus raising the cutting edge. A cut is taken in each groove of the barrel before moving the wedge farther forward to raise the cutter for a deeper cut. The front end of this hook-type cutter, which comprises three-quarters of the length of the cutter, butts against a steel plunger within the tube which has a coil-spring in front of it. The front end of the cutter is not finished off at right-angles to the top surface of the cutter in front of the hook but is beveled back from the top at about ten degrees. The end of the spring-backed plunger is beveled at ten degrees in the opposite direction, so that its included angle with its top surface is 100 degrees. This is done so that the front end of the cutter is held upward against the top surface of the rifling head. The cutter is about two inches long over all and the rifling head six inches long. The top or cutting edge of the hook is cut on the arc of a circle the same as was described for the simple-type cutter. Hook type of commercial rifling cutter and rifling head. The cutting edge of a rifling cutter is ground and honed to a gauge or template, so that when it is re-sharpened or rehoned during the rifling operation its form is not changed at any point. This cutting edge must be kept very sharp and very smooth to do good work, as barrel steel is tough and tends to tear, rather than cut clean, unless the tool is perfect. The scrape-type of rifling head leaves a better finish in the grooves than does the hook-type but it is more difficult to keep sharp and requires very careful honing. Its cutting action is a scrape rather than a shearing cut and the shavings are extremely fine, rather like very fine shavings cut from wood with a fine file. The rifling head is a hollow cylinder of high-carbon steel with a port for the cutter cut lengthwise, about two inches long, in one side. This port is very accurate in shape and size as the scrape cutter must fit it closely with no shake whatever, as this cutter cuts in both directions while traveling through the barrel. This rifling head is about six inches long and is internally threaded at both ends, a thread at one end for attaching the pull-tube, which also carries a supply of oil to the cutter, and a fine thread at the opposite end for the adjusting screw to raise the cutter. In the bottom of the rifling head between the port for the cutter, but upon the opposite side, and the fine threads for the adjustment screw, a narrow slot is cut lengthwise of the head. This is for the head of a screw to ride in which is screwed into the bottom of the adjusting wedge. The cutter body is a very exact fit in the port in the rifling head and the bottom of the cutter body is ground on a taper of about ten degrees from one end to the other. The face of this taper is at an exact right-angle to the sides of the cutter body. The cutting edge of scraper on top of the cutter body is not at right-angles to the sides of the cutter body and rifling head but extends across the top of the cutter body at a forty-five degree angle to give as much shearing effect to the scrape as possible. This scraper is at the central point of the cutter body and the body of the cutter is cut away at each side of the scraper to give chip space. The actual edge that does the scraping is an included angle of eighty degrees, the sides sloping down and away from the edge equally in both directions to the top of the cutter body. This scraping edge also has the contour of the arc of the circle the diameter of which is that of the groove diameter of the barrel. This edge must be ground and honed to a template so that its shape will be true and will remain so. The template is cut from thin sheet-steel. The wedge which raises the cutter in its slot in the rifling head has a circular contour on the bottom to fit the contour of the inside of the rifling head upon the bottom. The top of this wedge is ground off on a ten-degree taper to match that upon the bottom of the cutter body. The thickness of this wedge is such that its thin end extends slightly beyond the thick end of the cutter body, which is toward the end of the rifling head to which the pull-rod is attached. This thin end of the tapered wedge is ground square on the end and this square end butts against a square-ended plug, backed by a spring, which spring is in turn backed by the end of the pull-rod inside the rifling head. In the bottom of the wedge a hole is drilled and tapped for a small screw, the head of which closely fits the slot cut in the bottom of the rifling head. This screw prevents the wedge from turning and should be hardened to prevent undue wear. The adjusting screw for the wedge has an unthreaded portion beyond the threaded part, smaller than the threads. The end of this unthreaded portion is ground square and butts against the large end of the adjusting wedge. As this adjusting screw is screwed forward in the rifling head it moves the tapered wedge forward under the cutter, raising it as necessary. Now that .we have the rifling heads and cutters made, the next thing is a rifling machine to use them. These are of several types, from the regular factory rifling machine to the lathe and the various types of hand-rifling machines, usually called a rifling bench. Details of hand rifling bench, using an old rifle barrel for a guide in rifling a barrel blank. Circular sketch shows detail of the indexing fixture and method. desire grooves in the barrel to be rifled. A pin passes through this last clamp at a point in line with the holes drilled in the sleeve, so that when the guide barrel is loosened in its clamps, the guide barrel and sleeve can be turned, so as to bring one of the pin holes in the sleeve in line with the pin hole through the clamp in which the sleeve operates. This pin must fit the holes in clamp and sleeve very closety, the sleeve must fit closely in the clamp, and it can also be locked by having the clamp split at one side and a clamp bolt passed through the two sections. The flange on the sleeve is to prevent end motion of the guide barrel. A rod or tube long enough to pass through both the barrel to be rifled and also the guide barrel, with some several inches to spare, is attached to the rifling head. This rod or tube must have a guide block upon it to ride in the grooves of the guide barrel to cause the rifling cutter to turn. The simplest way to make this is to place the rod inside the guide barrel, packed with waste at a point four or five inches below the muzzle. Fastening the barrel muzzle-up, heat the barrel and the rod from the muzzle down to the packing point, with a torch until it is pretty hot and. making sure that the rod is central in the bore, pour in melted nickel-babbit around the rod until the barrel is full to the muzzle. After it has cooled, withdraw it partly from the barrel and shave off the outer end, where it overflowed the muzzle. Now, make a punch mark on the muzzle of the barrel at one of the grooves and mark the babbit slug on the end opposite this mark on the barrel, so that if this guide block is removed from the guide barrel you will get it back in the same position in which it was cast. Remove the waste from the barrel and clcan the barrel out well. Reinsert the rod and guide block in the guide barrel, then attach to the rear end of the rod a sturdy cross-handle, mounted on the rod on ball-bearings. The rod, with the guide in place in the guide barrel near the end closest to the barrel to be rifled, should be long enough so that the rifling cutter clears by an inch or more the opposite end of the barrel to be rifled. With the clamps all locked and the rifling cutter in position in the head, the rifling cutter is now drawn through the barrel to be rifled, making the first cut. The cuttcr is then dropped down, or, if it is the shimmed-up type of hook cutter, it is removed from the rifling head and the head is pushed back through the barrel. The cutter is replaced and the clamps on the guide barrel are loosened then the index pin is withdrawn and the guide barrel revolved in the clamps to the next pin hole, the pin is replaced, the clamps are tightened and the cutter is again drawn through the barrel to make a cut for the second groove. 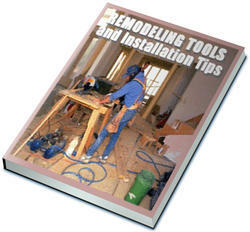 This process is repeated with the same cutter setting until one cut has been made in each groove. The cutter is then raised and a second cut is made in the first groove, and all this is repeated until the grooves are all cut to the proper depth. The guide barrel must be kept well oiled on the inside and the barrel being rifled must be flooded with cutting oil, either lard-oil or black surphur oil compound. This cutting oil should be fed into the barrel under pressure so that it will wash out the chips and for this reason it is better to use a tube for a pull-rod, as the oil line from the pump can be attached to the end of the tube opposite the rifling head and the oil can be pumped into the barrel by this method by having oil outlet holes drilled in the rifling head. An automobile oil pump driven by a small electric motor can be used, or the oil can be forced through the barrel by air pressure, if you have a compressor. As the oil leaves the barrel it is screened to remove chips and is returned to the sump from which it is pumped. Circular grinding of a chambering reamer in the lathe, using a Dumorc clcctric tool po*t grinder and an adjustable tail center. After a chambering reamer is Hutcd and the clearance is ground on it. the reamer is hardened while still .012" to .015" oversize. It is then replaced in the lathe and with the lathe-centers in line the pilot of the reamer is ground to size, using the electric tool post grinder. The lailstock is llicn set over to bring the slight taper of the neck portion of the reamer parallel to the center line of the lathe. This portion of the reamer is then ground to size. The tailstock is then set over the additional amount to bring the body portion of the reamer parallel to the lathe center line and this portion is then ground to size. Instead of offsetting the tailstock center an adjustable tail ccnter, as shown above, can be used. 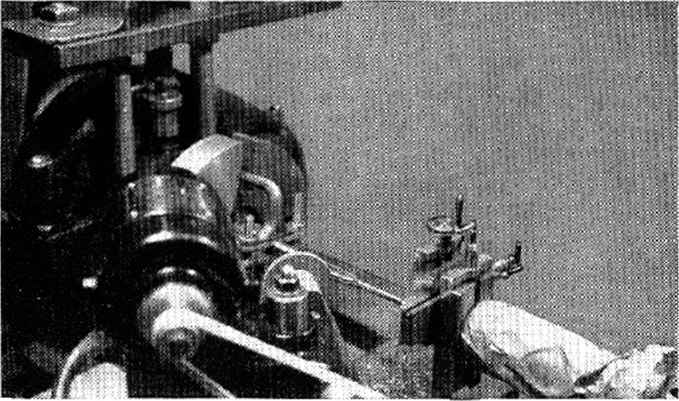 A shows simple type of scrape rilling cutter, showing how adjustment is made with a tapered raising wedge, held from turning by a set screw screwed into the bottom of the tapered wedge and riding in a close fitting groove in the bottom of the rifling head. Bottom sketch B shows method of rifling a barrel blank in a hand rifling bench by using a grooved steel shaft for a rifling guide. How to make homemade Barrett m82a1? How to “Cut” Rifling Machine Works? Who made barrel rifling machines? How make hand made single point cutter for rifling barerels? How to repair rifling in a rifle? Who made barrel rifleing machines? Where to antique gun barrel rifling machine? Where can i buy a rifling tool? How to repair rifling in a gun barrel? How does a barrel rifling machine work? How to Make a Rifling Cutting Tool? How is made rifling in the barel?